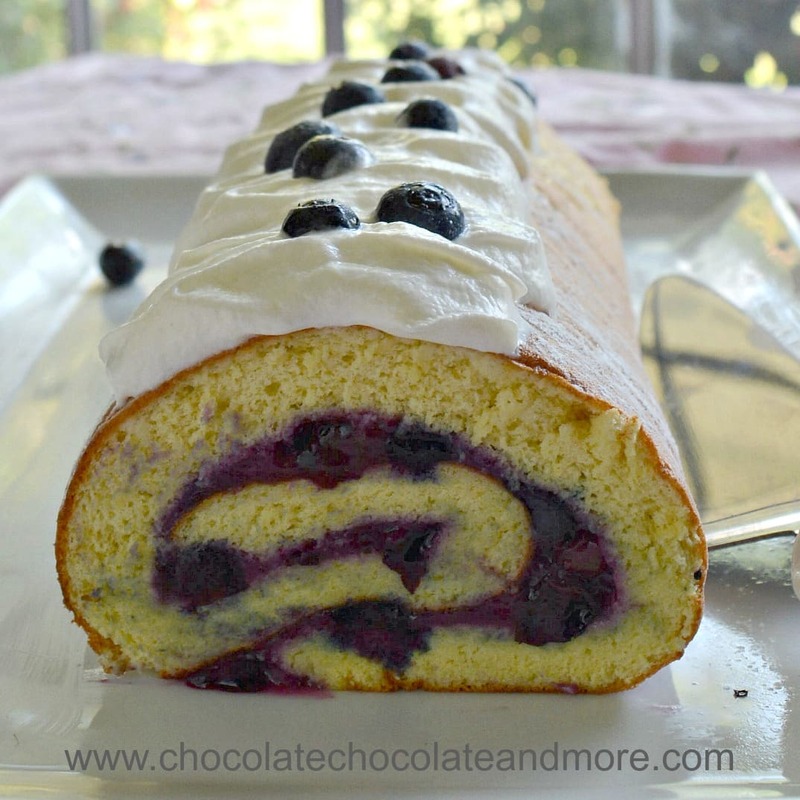 Vanilla Blueberry Cake Roll - Chocolate Chocolate and More! Fresh blueberry and lemon curd filling in a vanilla sponge cake topped with powdered sugar and whipped cream. 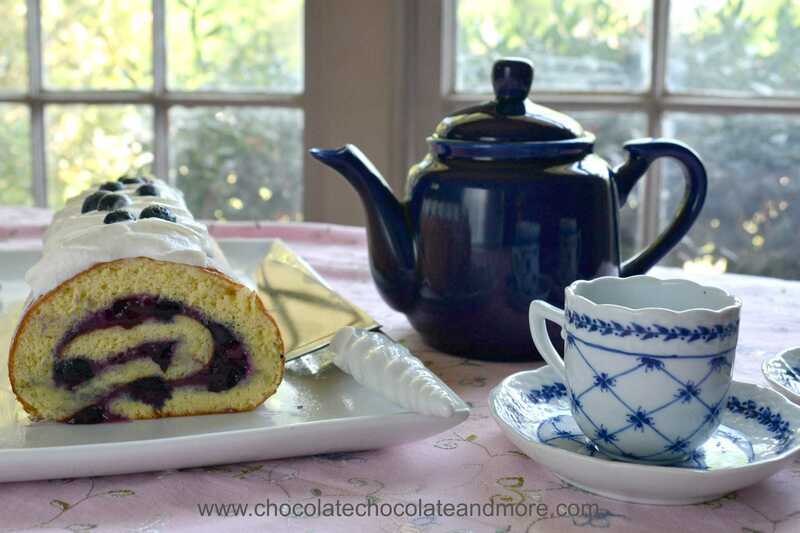 Vanilla Blueberry Cake Roll is a simple dessert that can be served for breakfast or afternoon tea. Spring is a time for berries. When I was a kid, we had strawberries growing under the water tap in the back yard. Every time someone turned on the tap, a little water would leak from the hose and water the berries. It was the perfect spot for strawberries so we always had lots of large, sweet strawberries. Our neighbors had raspberry bushes and we used to sneak raspberries from those too. Texas is too hot and alkaline for raspberries and strawberries don’t do well here either. I did have a blackberry bush in my yard but it died while I was away in Cambodia. I’ll replace it when I get back next time. Joan was lucky to have a neighbor with HUGE blueberry bushes so she always had a nice supply in the spring. In the meantime, I buy my berries at Costco. They’re so cheap and plentiful there. They had fresh blueberries last week so I couldn’t resist. It took me a few days to decide what to do with my precious blueberries but I thought a simple cake roll would be fun. Vanilla Blueberry Cake Roll starts with a simple sponge cake. The great thing about this recipe is the sponge cake is very flexible and doesn’t need to be rolled up while it cools. Because the sponge cake is thin, it cooks and cools quickly so you can make this cake in about 1 hour. I made the filling while the cake was baking and refrigerated the filling while the cake cooled. Rolling the cake is easy. Just start one end and then pull the parchment paper upwards to roll it the rest of the way. The sponge cake is very flexible so you don’t have to worry about cracks while you roll. There are some simple changes you can make to change this recipe up. For a gluten-free version, substitute almond flour for the all purpose flour in the recipe. For a more lemony cake, substitute lemon extract for vanilla and add a tablespoon of lemon zest to the cake. Almond flavoring also works well in this cake but use it sparingly. You can add 1/4 teaspoon almond extract to the recipe if you like almond. 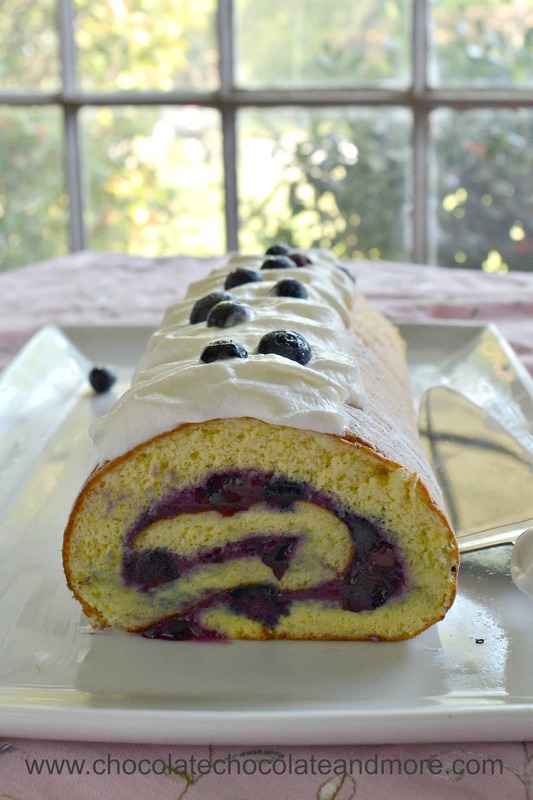 Served plain, vanilla blueberry cake roll makes a lovely breakfast. Dress it up with a little whipped cream for dessert or afternoon coffee. Preheat oven to 350°F. Oil a half sheet jelly roll pan (12" x 16" x 1" -- large cookie sheet size). Cut a sheet of parchment paper to fit in bottom of the pan. Place the parchment sheet on top of the oiled bottom and then oil the parchment sheet. Set aside. Beat egg yolks and ⅔ cup sugar until light and thick (about 3 minutes). Add in vanilla, salt and flour. In a separate bowl, beat egg whites until frothy. Add cream of tartar. Continue beating until soft peaks form. Gradually add remaining ⅓ cup sugar and beat until stiff but not dry peaks form. Fold egg white meringue into egg yolk mixture one third at a time. Be careful not to deflate the egg whites. Pour batter into prepared pan and spread evenly. Bake for 15-20 minutes or until golden brown. Top should spring back when lightly touched. While the cake is baking, prepare the blueberry filling. When the cake has cooled to warm (not hot), loosen the edges with a sharp knife. Dust the top lightly with powdered sugar and place a piece of parchment paper on top. Invert the pan with the parchment paper on top onto a cooling rack. Peel off the oiled parchment paper and let the cake cool completely (about 15 minutes). Spread blueberry filling over the top of the cake leaving about 1 inch at the end (it will fill in when you roll the cake). Beginning at the other end of the cake, roll the cake. I started rolling the cake like I would some wrapping paper for one turn. Then I used the parchment paper to finish the rolling by just lifting up the end. You can tighten the roll by folding the parchment paper around the outside of the cake so that both ends of the parchment paper touch on the side with the seam. Place a ruler (or straight edge) on the top sheet of parchment paper near the bottom of the cake (it should be parallel to the cake). Hold the bottom sheet and push the ruler (and top parchment paper) under the bottom of the cake. Wrap the cake in the parchment paper and refrigerate until ready to serve. To serve, place cake on serving plate and remove parchment paper. Dust with powdered sugar and/or top with whipped cream and fresh blueberries. Place all ingredients except lemon curd in a medium sauce pan. Heat on medium high until blueberries soften and mixture thickens (about 5 minutes). Smash most of the blueberries with a spoon while heating. Remove from heat and add lemon curd. Refrigerate until ready to spread on cake. For a gluten free option, replace all purpose flour with almond flour. This sounds like a lovely Spring dessert! I do believe you meant egg yolks in step 2. Thank you for sharing! Thanks for catching that mistake Misha. I’ve fixed it now. What else can be used in place of lemon curd? Hi Susan, you could just use a little lemon juice. The curd adds a little tartness to the blueberries and helps thicken up the sauce but there’s plenty of cornstarch in it so it should still work with just lemon juice.